Do you like to order clothes online but have trouble ordering the right size? Well, Otero Menswear offers a “virtual fitting room” that helps men select the exact right size and style for their body type, helping make online orders more accurate and reduce the need for costly returns. Most of the avatar creation solutions we have seen have been for women. Nice to see it making its way into menswear as well! Want to send a really personalized gift this Christmas season? 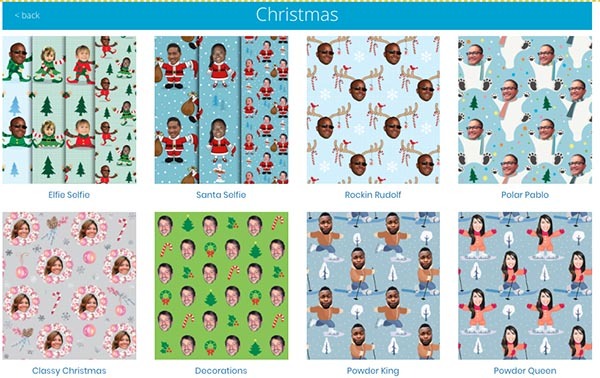 We can’t help with the contents, but thanks to giftwrapmyface.com, you can create custom wrapping paper. “Create your own personalized gift wrapping paper and stationery featuring your face, your pets', or the people you love.” Simply pick a design, upload the photo of your choice, and voilà! A full roll goes for $16.95, a half roll for $9.95. Are you taking advantage of the cannabis wave? Then RayWear Clothing has something you should look at. RayWear's revolutionary gear protects growers from harmful light radiation created by modern cultivation environments. Attention has been paid to a number of cannabis-related factors, but RayWear says not enough attention has been paid to worker safety and the long-term effects of the grow lights. If you both find yourself in Carmichael, Calif., near Sacramento, and in need of an antique typewriter (and perhaps it’s safe to say that that’s the only kind there is anymore), well, are you in luck! The remnants of an office machine store—which has been closed for about 10 years—is trying to unload its vast inventory of archaic typewriters, checkwriters, adding machines, and other unearthed arcana. Visit The Typewriter Revolution for more info. But...it always pays to read to the end. In order words, they’re ready to order, yes. Ship? Not just yet. So don’t ditch your strictly horizontally moving car just yet. Researchers in Switzerland are playing Led Zeppelin and Mozart to cheese, to determine whether different sound waves improve the taste. This magic biomaterial is mycelium, the vegetative part of the fungus. If you imagine that mushrooms are the ‘fruits’ of the fungus, mycelium could be regarded as its roots or stems. It looks like a mass of white thread-like structures, each called hyphae, which crisscross soil and other material in which fungi grows. Collectively, these threads are called mycelium and are the largest part of the fungus. Mycelium has amazing properties. It is a great recycler, as it feeds off a substrate (like sawdust or agricultural waste) to create more material, and has the potential of almost limitless growth in the right conditions. It can endure more pressure than conventional concrete without breaking, is a known insulator and fire-retardant and could even provide radiation protection on space missions. So far, so good. Mycelium is actually currently used to produce ceiling panels, packaging, and building materials. But what about the sweat? Ciokajlo wanted to use the human body as the source for some of the building materials and decided to employ sweat. Reusing perspiration is not entirely new in space exploration (the International Space Station currently reuses astronauts’ urine and sweat for drinkable water) but a novelty approach for footwear. She thinks it might make astronauts feel closer to home during the long journey to Mars. An artificial intelligence (AI) system has been used to synthesise [news] presenters' voices, lip movements and expressions. 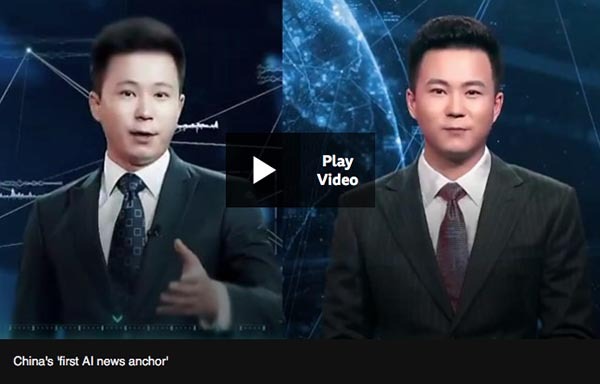 They are based on those of real Xinhua presenters. What’s the Deal with “The Piña Colada Song”? 1499: Publication of the Catholicon, written in 1464 by Jehan Lagadeuc in Tréguier, the first Breton dictionary and the first French dictionary. 1857: American journalist, author, reformer, and educator Ida Tarbell born. 1885: American historian and philosopher Will Durant (The Story of Civilization) born. 1959: Canadian singer-songwriter and guitarist Bryan Adams and, 1974, American singer-songwriter and guitarist Ryan Adams born. The coincidence cuts like a knife. 2007: Android mobile operating system is unveiled by Google. 1814: Belgian-French instrument designer and inventor of the saxophone Adolphe Sax born. 1869: In New Brunswick, New Jersey, Rutgers College defeats Princeton University (then known as the College of New Jersey), 6–4, in the first official intercollegiate American football game. 1935: Edwin Armstrong presents his paper “A Method of Reducing Disturbances in Radio Signaling by a System of Frequency Modulation” to the New York section of the Institute of Radio Engineers—basically inventing FM radio. 1947: Meet the Press, the longest running television program in history, debuts. 1958: American actor, puppeteer, producer, comic, and screenwriter Trace Beaulieu (Mystery Science Theater 3000) born. 1665: The London Gazette, the oldest surviving journal, is first published. 1837: In Alton, Ill., abolitionist printer Elijah P. Lovejoy is shot dead by a mob while attempting to protect his printing shop from being destroyed a third time. 1874: A cartoon by Thomas Nast in Harper’s Weekly is considered the first important use of an elephant as a symbol for the United States Republican Party. 1897: American director, producer, and screenwriter Herman J. Mankiewicz (Citizen Kane) born. 1913: French novelist, philosopher, journalist, and Nobel Prize laureate Albert Camus born. 1914: The first issue of The New Republic is published. 1929: The Museum of Modern Art opens to the public in New York City. 1943: Canadian singer-songwriter and guitarist Joni Mitchell born. 1967: U.S. President Lyndon B. Johnson signs the Public Broadcasting Act of 1967, establishing the Corporation for Public Broadcasting. 1994: WXYC, the student radio station of the University of North Carolina at Chapel Hill, provides the world’s first internet radio broadcast. 1602: The Bodleian Library at the University of Oxford is opened to the public. 1847: Irish novelist Bram Stoker (Dracula) became undead born. 1918: German typographer and calligrapher Hermann Zapf born. 1972: HBO launches its programming, with the broadcast of the 1971 movie Sometimes a Great Notion, starring Paul Newman and Henry Fonda. 1973: The right ear of John Paul Getty III is delivered to a newspaper together with a ransom note, convincing his father to pay $2.9 million. 1818: Russian author and playwright Ivan Turgenev born. 1934: American astronomer, astrophysicist, and author Carl Sagan born. 1967: The first issue of Rolling Stone magazine is published. 1947: English singer-songwriter, guitarist, and producer Greg Lake born. 1969: National Educational Television (the predecessor to the Public Broadcasting Service) in the United States debuts Sesame Street. 1983: Microsoft introduces Windows 1.0. 1675: Gottfried Leibniz demonstrates integral calculus for the first time to find the area under the graph of y = ƒ(x). 1821: Russian novelist, short story writer, essayist, and philosopher Fyodor Dostoyevsky born. 1922: American novelist, short story writer, and essayist Kurt Vonnegut born.